PAN is a newsreader that has been around for ages. It allows you to sift through the massive clutter that Usenet has become through its really fast interface loaded with tons of features! It’s development died off way back in 2012, but recently it’s development has picked right back up again. Not only is this product feature rich and open source, but it’s written purely in C++ which makes it incredibly light weight (thus very, very fast). Some of the subtle product enhancements this product has seen in the past few months make it worthy to be in the spot light again. Header Caching: Tell it the group(s) you want and how much of it you want to see and it will download the headers it retrieves to a local cache file. This is awesome because now you can sift through this content offline. Header Scoring: You can flag key aspects of articles with a score. By default every header retrieved has a score of zero (0) unless you start dabbling in this area. Anything that scores less than (or equal to) -9999 can be configured to not list itself at all. Some well set scores can greatly clean up your ability to locate content in groups. You can score content higher and/or lower based on the posts author, subject, size, age, etc. You can even apply scoring through regular expressions too! Multiple Server Support: Got a block account? No problem, you can add it as a secondary server and only pull from it if the Primary one is unavailable. NZB-File Support: The treasure maps of Usenet can be loaded into Pan too and downloaded through it. True automation of these come through systems like NZBGet and SABnzbd, but it’s still worth knowing that not only is this a newsreader, but it can pass as a downloader as well! Concurrent Connections: Like any great browser/downloader of any system; files are retrieve concurrently. This means that you can just keep browsing and tagging content of interest seamlessly without interruptions. Header Compression Support: One of the new enhancements surfaced with the new development of this project. This makes a world of difference when retrieving hundreds of thousands of headers from a Usenet group. Enabling this feature along (if your Usenet provider supports it) will greatly reduce wait times! The features page on PANs website explains about a parent company (called ChimPanXi) that tries to sell this free product with added functionality. I guess the deal they have with the developers is to just disable a few features so that they can be re-enabled them the paid version (purely speculation)? But since the (Pan) code is open source, the options are right there in front of us but just disabled. Quite honestly… of all this disabled functionality, only one is truly worth pointing out: Pan restricts you to just 4 allowable concurrent connections to your Usenet provider at a time. Here is a small patch I created which increases this number to 99. The build I provide in this blog already has this patch applied. Here are the rest of the missing features (with some of my comments as well); maybe some might see value in the others? el7.rpm, fc22.rpm, fc23.rpm, fc24.rpm, fc25.rpm The Newsreader: This is the program that this blog focuses on. It’s also worth noting (again) that this build includes a small patch to increase the maximum allowable number of concurrent connections from 4 to 99. There is very little security built into Pan from a connection point of view. What little security is (normally) in place is built using GnuTLS. GnuTLS has a history of not keeping up with the security exploits and vulnerabilities that surface with encryption libraries. It doesn’t make it unsafe; it just doesn’t make it as reliable as it’s competition (OpenSSL and Crypto). For this reason the packages I provide are intentionally not built against it (GnuTLS). It’s really not a problem at the end of the day because there are other ways of securing this connection (properly). The way I use (and recommend) is through Stunnel. Stunnel allows you to take an unencrypted input (from Pan) and connect it to a secure connected one (at your Usenet provider). The best thing about stunnel is that it links to your (OpenSSL) shared system libraries libssl.so and libcrypto.so which are actively maintained and patched! 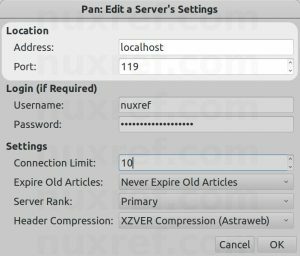 Basically what I’m saying is by attaching Pan to Stunnel: you get the feature rich usage of Pan and the ongoing (reliable) security of OpenSSL. el7.rpm, fc22.rpm, fc23.rpm, fc24.rpm, fc25.rpm Secure Tunnel: for data encryption. Note: This RPM is not required by PAN to run correctly. It does however offer you a safer and more secure method of encrypting your communication to (and from) your NNTP Server. ; to point it to their secure transport point! You’ll provide the same username and password you would have otherwise provided to your Usenet provider. Pan’s built in filter field allows you to sift through all of the articles you found with keywords. Pairing this functionality with the scoring one really shows off the power of Pan. All created scores are kept in ~/.pan2/Scores so don’t worry if you mess one up. You can just as easily open this file and fix it. Any manual changes to this file will however require you to exit out of Pan (if it’s open) and restart it. % identified above. These will just sit at +2400 instead. I’m certainly not asking anyone to change from their existing system if it works for them. What I am pointing out though is that Pan is completely free, it’s open source and the features it offers are comparable (if not better) than all of it’s competition. Although it works great on Linux, it also works on many other platforms as well such as Microsoft and Apple. It might not have a beautiful interface, but it wasn’t built to fill your systems memory with bloated eye candy. It was built to be fast and effective… and truly, it really is. The newer versions coming out are really great! If you haven’t given it a try since it’s dated ones, you really should! If you’re interested in seeing how Usenet is structured, than this is also a great tool to learn with. If you run an indexer (such as newznab or the many forks of it) you can practice your regular expressions (regexs) using Pan. For an Indexer Admin, this tool is especially great in debugging your regexs! This blog took me a very long time to put together and test! The repository hosting alone accommodates all my blog entries up to this date. All of the custom packaging described here was done by me personally. I took the open source available to me and rebuilt it to make it an easier solution and decided to share it. If you like what you see and wish to copy and paste this HOWTO, please reference back to this blog post at the very least. It’s really all I ask. Regular Expressions: A great location to read up more on regular expressions if you’re not already familiar with them. Windows Users might be interested to know they can run this too. A Usenet Solution For CentOS 6: Talks about both SABnzbd and NZBGet and is still applicable for CentOS 7.x systems. NZBGet v17 for CentOS 7: Also applicable to newer versions of NZBGet too! This entry was posted in Linux Tools and tagged Centos, Fedora, Linux, Microsoft, Newsgroups, nntp, nntps, pan, Red Hat, RHEL, RPM, stunnel, usenet on March 10, 2017 by l2g.